Benevolent aliens from the planet Emerald send superhero Starman (Ken Utsui) to protect Earth from an invasion by an evil alien race called the Spherions. 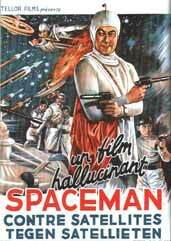 When Starman arrives on Earth he discovers a conspiracy involving the worlds top scientists and then must root out the traitors and also stop the impending alien invasion. Also stars Sachihiro Ohsawa.